Why did nobody tell me Lisa McMann had a new book out? I loved the Wake trilogy, loved it ever since I first picked up the original book. 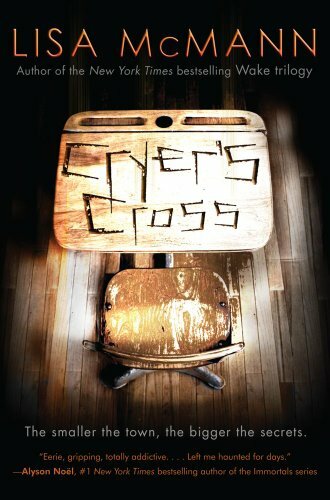 I stumbled on Cryer’s Cross by chance and let me tell you, I was ecstatic. It didn’t disappoint. Kendall Fletcher is a teenager with OCD, living in the small Montana farming town of Cryer’s Cross, where high school can be contained in one room and pretty much everything revolves around the potato harvest. At the start of her senior year, Kendall’s best friend Nico disappears without a trace – just like a freshman girl who’d vanished months earlier – and the community is in an uproar. Caught in a downward spiral without her friend’s guiding light, Kendall fears that she’s losing her mind, especially when she starts to hear the voices of the missing calling out to her from graffiti on an old school desk. There is something really intriguing about McMann’s writing style. It’s simplistic, straightforward, and, at first glance, seems to break the most oft-repeated writing “rule” – that is to say, that it tells more than it shows – yet it works. It works wonders. It drives you straight through the story, the momentum bolstered by wonderful character development and great pacing. Another thing I have to appreciate: unlike most paranormal romance series, I can actually fall in love with McMann’s bad boy heroes. Jacián Obregon seems like the world’s biggest jerk and is initially suspected to be behind the missing freshman’s disappearance. He’s got the attitude, the danger element, and the general uneasiness of a newcomer in a tight-knit little town. But unlike so many bad Byronic alpha males in YA pararomance, Jacián is actually a good person underneath everything. He has moments when he’s a jerk, and moments when he’s sincere. He has understandable frustrations that he takes out in understandable but frustrating ways. He and Kendall have some genuine chemistry that evolves over time, and it’s believable. He is a genuine, attractive male lead. YA romance writers, take note: this is how a romantic lead should be done. And even better? The conclusion of the book, after 150 pages of atmosphere building, creepy voices, and romantic tension, is genuinely scary. I mean, I sat in the parking lot of a McDonald’s and let my food go cold because I didn’t want to put it down, oh-god-oh-god-what’s-gonna-happen-next scary. It’s an excellent pay-off for an excellent book. If you somehow haven’t read anything by Lisa McMann, start with this stand-alone, then go get the Wake trilogy as soon as you can. Cryer’s Cross is just plain good, and I can’t wait to see what the author’s going to come up with next. Don’t bring in a perp unless you’ve got something on ‘em. If you don’t have anything to go on, it’s a waste of time. With that mind, investigate any and all leads to their fullest before discarding a suspect. When you drag one in for interrogation, let ‘em stew for a while before you start. It builds tension and sends the mind wandering to all the horrible – and wonderful – possibilities. Be flexible. Different perps break at different things. If they’re not responding to you, change your approach or bring in someone that they will respond to. When you do bring in outside help, trust your team and be aware of their strengths and weaknesses. When you’re a probie, you will make mistakes. Everyone does. The important thing is to learn from them, so you’ll become better in your prime. The people who knew you when you were a probie will never let you forget that you were a probie. Come to terms with this now. On the plus side? You’re their probie, and they’ll be looking out for you. Don’t be afraid to raise your voice and get your hands dirty. Sometimes, you need to break a finger to get your answers. Sometimes it's good to listen to authority. And sometimes, you need to tell authority to stuff it. Sometimes, you need to step away from the job for a few moments. Sometimes you need to step away for a few days. And sometimes you need to announce your resignation and disappear to Mexico for three weeks. The important thing is that you come back eventually and finish the job. But I think the most important thing I ever learned from NCIS was this: sometimes, it doesn’t matter if the investigation is going slow. Drama and good storytelling don’t have to come from action or from a rapid-fire barrage of clues connecting to other clues connecting to shocking revelations. If you have strong characters who have dynamic interpersonal relationships and good chemistry, they can carry the entire show on their own. I keep a form rejection letter in my wallet. There’s nothing particularly special about it. It’s not my first form rejection and it certainly won’t be my last. It’s not fiftieth or my hundredth or even my tenth. It just happens to be the one printed on a half-sheet of resume-quality cardstock that, when folded into fourths, fits perfectly inside my wallet. I started caring it with me on a whim, figuring that a reminder of my rejection would keep my self-righteous anger burning, which would continue to fuel my pride. But eventually, I got more used to the rejection scheme, and that anger faded. Yet, I still keep the letter in my wallet, because it’s become a different sort of charm. It reminds me not to take things personally. Yes, the worst damn part of a form rejection is its impersonality. God that sounds weird, but you know what I’m getting at. There’s a sting that comes with being rejected before you and your work have even been given a chance. It’s easy to fall into that slump where everything in the universe, especially agents and publishers, hates you and is going out of their way to make sure you don’t succeed. Clearly, they’re jealous of your amazing talents. And then you get into the game for a while and you realize that’s not case. Chances are, agents aren’t form rejecting you because they think your novel is bad, or because they don’t like the way that you write, or because they think you’re a bumbling idiot who wouldn’t know a good book if the hardback edition was lodged in your trachea. There are a million reason and none of them seem completely fair, from the writer’s point of view, but none of them are personal. I think we all need to be reminded of that sometimes, especially in day-to-day life. Dude cut you off in the intersection? It’s not personal. You don’t get that job you wanted? It’s not personal. Bird poops on your head? It’s probably not personal, but birds are SOBs so I’d keep an eye on them just to be safe. Long story short, most bad things that happen in our lives aren’t personal. They feel like it, sometimes, because everyone is the hero in their own little egocentric book; but in reality they’re not. And that goes for rejections too. Chasing trends is one of the big newbie author no-nos. It’s always the same advice. “By the time your book is finally published, the trend will have past and you’ll be yesterday’s news.” Good, solid stuff. But you know the real reason chasing trends is a bad idea? Even if you do manage to release your book during the spillover of the last big craze, it’s still not going to work because riding the coattails of an awesome premise does not make your work inherently awesome as well. Think about it, when was the last time you read a teen’s book about wizards and magic that genuinely reminded you of Harry Potter, or a mythology-based adventure series that rivaled Percy Jackson, or even a symbolism-charged conspiracy thriller that got even close to comparing with the craze of The Da Vinci Code? You can think of books that tried, I’m sure, but none of them actually lived up to their claims. It was always obvious that they were just copy-cats, occasionally gender-bent to appeal to the other half of the marketing demographic, occasionally played straight. They couldn’t live up to the original. I’d point to the teen vampires craze as an example, but I can’t actually tell the difference between any of those books, so I don’t know why Twilight and The Vampire Diaries were remembered while hundreds of others were ignored. So let’s look at dystopian teen fiction instead. The Hunger Games is often cited as being the source of this sudden trend. Dreary futures with metaphorical commentary on present society had turned up in teen fiction before – hell, the Uglies trilogy wrapped up its fourth installment, what, four years ago? – but Hunger Games is the one that really knocked it out of the park, it seems. Hunger Games isn’t popular because it’s a dystopian future novel. It’s popular because it was well-written, depicted interesting and relatable characters, and built an amazing world. It’s popular because it was innovative, interesting and just plain good. Trend-chasing completely misses the point of what made the books successful in the first place. It tries to define an entire complicated recipe by its key ingredient, like deciding that a soup was delicious because it was made with chicken broth and completely ignoring the delicious poultry, vegetables, and seasonings that developed its true flavor. Which is why, I think, that books like The Water Wars fail. They’re published and marketed to fit in a certain trend, and for all intents and purposes they match up to that trend, but they’re just not that good, so they don’t hold up. You can’t write a mediocre version of the book someone else has done better and expect to be as successful. Readers can tell the difference. At least, that’s the way it is in YA. For tomorrow, I am preparing a roaring blog dripped with righteous (and hopefully interesting) writerly rage and, even though I know I’m pretty much just talking to myself on this this, I don’t really want this blog to turn into one of those 24/7 negativity centers, even if I have been in an angry mood lately. So today I’m going to talk about something I find interesting: the genesis of a character. I like looking back on a finished work and figuring out where a character came from, why he or she came from there, and how they’ve managed to change throughout the course of the story. Sure, for novels I’ll often make a character sheet before starting off on the project itself, but it’s usually more of a guideline than some sort of rule book. You only get to know a character as you write them, after all. Asoresis’s name came first, and out of a random generator of all things. I was looking for a name to fill in the backstory of a Dungeons & Dragons character, so I went to a fantasy name generator and found one that I liked. With that done, the name floated in my mind for a while, as I really was fond of it. A few months later I got into the Bartimaeus trilogy for the second time in my life, having introduced it to my brother. The Bartimaeus books are, for the record of all time, fantastic. They’re some of the most creative and interesting fantasy novels out there, set in a world where magicians keep their aristocratic power over normal people by enslaving spirits, such as djinnis, to their will. Asoresis wandered into my mind as a fan character for this series, a sesquipedalian loquacious djinni more suited to running his master’s household as a butler than say, building monuments and stealing stuff as Bartimaeus did. Over time he developed the backstory that his usually appeared as a cat, but that his preferred human form was that of a former master’s son, which he’d kept in memory of the old man he’d care for. Eventually I realized that was a much more interesting original story than it could ever be as a fan fic, so I ditched the Bartimaeus world for its own setting. In this setting he lost his nature as a long-winded know-it-all and became the nearly silent, stoic companion he is today. And I got to play around with some Islamic-Christian symbolism, which is always fun. So you see, he changed a lot from his first incarnation to his final form. And as happy as I am with how he turned out, it’s interesting to look back at where he came from, and how that shaped the things in “Ala ad-Din” that others aren’t likely to understand. Like I said, this idea of tracing a character’s origins interests me. Some don’t have such a complicated genesis, but when they do, it’s almost a story in and of itself. Anyone else care to share yours? I’ve been thinking a lot about self-publishing lately. I’m sure this is going to come as a surprise to some of you, but I don’t actually hate self-publishing. I’ve been going out of my way to try and find some good self-published books and, while I’m still striking out in the novel department, I’ve found a lot of short story collections that are genuinely unique and interesting, but a bit too niche to make a mainstream debut. In short: they’re perfect for self-publishing. So no, I don’t hate self-publishing, the idea has potential. What I hate are crappy books and self-righteous jackasses; both of which are, unfortunately, a part of the self-publishing community, though I can only hope they’re diminishing into a vocal minority. I also kind of resent the logical fallacy that, “everyone has stories, therefore anyone can instantly be a writer,” but that’s another blog post altogether. Where was I again? Oh yeah, self-publishing. I would, however, like to start editing self-published books, because it’s needed, I’ve been schooled in the techniques, and I’m interested enough to give it a go. I’m also unemployed with a lot of time on my hands. And because, honestly, if a self-publisher is willing to go the distance and hire an editor, even a cheap, inexperienced newbie like me, then they deserve a certain amount of respect. Getting an editor means they're being professional about their work. Responsible. It means that they want the best for their project, they want their work to be the best that it can be. Heck, they've probably also hired a graphic designer to create an engaging cover. That's the kind of self-publishing that I can respect, because they're not narcissistic or ignorant. They're responsible professionals. You know my favorite part of a new project? The beginning. I think most writers would agree with me. Everything is fresh and new, well-greased wheels are turning in my head, and the story is unfolding before my very eyes. You know my least favorite part of a new project? Most authors would say “the middle,” because everybody knows that the muddled middle is the hardest part to get through. But no, not for me, that is not the part I dread. The muddle middle is easily overcome with a little dedication and often unfolds into something more awesome than anything you imagined. No, it is not the middle that I dread. And so on. I’m never happy with my endings, and it leaves me reluctant to write them. This is why word quotas are important for me towards the end of a project. If I waited for inspiration on my endings, I’d rewrite the beginning over and over again and never wrap it up. Moreover, I always have this problem bringing projects to an end. I dread it, and not just because they’re tricky to write. I feel the same trepidation when I reach the end of a book series, or a comic that I really enjoy. I don’t want them to end, so even if I know the ending’s going to blow my mind, I’m reluctant to reach it. This is a big problem right now, because both of my major projects are at their ends right now. At least the video game has an excuse – it’s really tough to write a conversation that has to change depending on what was said before – but there’s really no reason for this to be happening in Necropolis. I’m literally two and a half scenes from the end of the draft. I should be able to pound it out in a week. But instead, my mind wanders from the subject and onto blog posts, coding and spending hours wandering the internet. I sit down to write Necropolis, and I stare at the screen, my mind wandering off into the snow. I wonder if other writers have this problem. Does it change if you don’t plot, the way I do? Or do other plotters have the same issue? How does everyone else approach their endings, I wonder. Does it get easier the more endings you manage to write? Or is this just part of the whole writer thing? As you can see, the ends of my blog posts are no better than the ends of my stories.